From spring 2019, Biella and Trivero will host a big exhibition project developed over three different venues: Palazzo Gromo Losa, Cittadellarte and Casa Zegna. Curated by Alberto Fiz, it puts Michelangelo Pistoletto’s and his father Ettore Olivero Pistoletto’s arts in dialogue with each other. Here is an anticipation of the event. Three locations for a single project realised by Fondazione Cassa di Risparmio di Biella, Cittadellarte – Fondazione Pistoletto and Fondazione Zegna: it is the exhibition “Padre e figlio”, opening on 16th April 2019 and running from 17th April to 13th October 2019. Curated by Alberto Fiz, it will develop throughout three main venues, i.e. Palazzo Gromo Losa (Corso del Piazzo 22-24) and Cittadellarte (via Serralunga 27) in Biella, and Casa Zegna in Trivero (via Guglielmo Marconi 23). 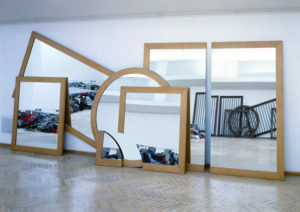 As the title suggests, the initiative puts in dialogue – in a sort of generational comparison – the works by the artist from Biella with the works of his father Ettore Olivero Pistoletto (1898-1982), painter of landscapes and still lifes, whose artistic career is strictly linked to Ermenegildo Zegna’s (1892-1966). The narrative emerging is an opportunity to face the multiple themes of one of the big archetypes of history, i.e. the relationship between father and son, particularly relevant in times of deep social transformation like ours. We read in a press release anticipating the contents of the exhibition: “Object of investigation since ancient times (let’s think of the myth of Oedipus), this relationship, with all its implications and nuances, will be the theme of debates and in-depth analysis throughout the exhibition, making Biella the starting point of a discourse destined to extend to a national level”. A reflection particularly relevant and topical in the context of our wool manufacturing district, with its entrepreneurial tradition and the subsequent delicate generational passage. And it is Michelangelo Pistoletto himself who marks the path: the crucial issue is “to leave an inheritance to the fathers”.